The Lucky Ranger is NZ’s smallest camper with a toilet and shower! 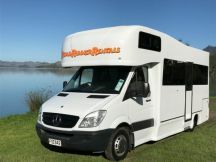 This purpose designed vehicle has three seats belts in the driver's cab and is one of the best options for budget travellers wanting to explore New Zealand with the option of being able to camp anywhere with full onboard facilities for two people (or two adults and one child). Please note the middle front seat only has a lap belt. The Lucky Ranger offers the budget minded traveller a great way to see New Zealand. 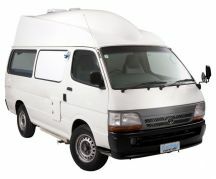 Model age 2000-2005 years of age (new camper fit out 2007). This vehicle is certified self contained. 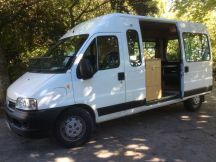 This vehicle can be used to Freedom Camp.A child seat can be fitted into this vehicle. (Middle seat is Lap belt only - comes across the lap). 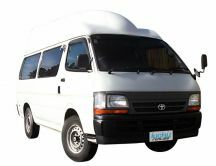 The Lucky Roadie 3 Berth Toyota Hiace Diesel Automatic is a great campervan if you are on a budget but want something nice. It is equipped with everything you might need, while still being spacious, comfortable, and easy to drive with its 3.0L,diesel, 4 cyclinder engine and automatic transmission. Vehicle age 1999-2002 (Interior retfit 2006). A child seat can be fitted into this vehicle. You are viewing page 2 of 28.